Garlic is one of the world’s most valued ingredients, synonymous with so many cuisines that most kitchens would be bare without it. Not only does is have an irresistible flavour, it also has astonishing healing powers. Consuming just one clove a day will not only top up your body’s supplies of vital vitamins and minerals, but also help maintain a healthy heart and help the body fight off infection. So inspire your culinary creativity with this medicinal marvel. 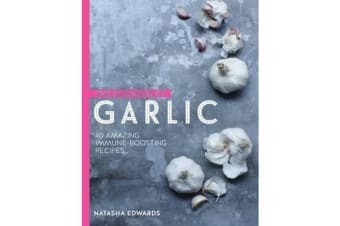 Part of The Goodness Of… series of healthy ingredientled cookery books, Garlic harnesses the extraordinary health benefits of this mighty bulb in simple and varied recipes, from classic dishes such as Aioli and Chicken with 40 Cloves of Garlic to salad dressings and immune-boosting winter soups. Growing up with garlic has excited and inspired Nathasha Edwards to create dishes that burst with flavour and boost your health.